July 21, 2016 Bridge Replacement Notice: The bridge located at 28km on the Finn Creek FSR is being replaced between July 15th and August 31st. During this time there will no access to Tum Tum Lake from the north. Tum Tum FSR remains closed due to the 2015 washouts with no ETA for a repair as this time. Access to Tum Tum Lake from the south is via: Vavenby Adams FSR to 38km – Adams FSR south to 67.5km – Road 40 FSR (Adams east) to 3km – Harbour Lakes to 27km – South Dudgeon to 0km then Tum Harbour to 28km on Tum Tum. Signs have been posted at 0km on Finn Creek FSR and 28km on the Tum Tum FSR indicating the bridge replacement. Upper Adams River Provincial Park protects 65 km of large river floodplain. This park protects a very old, undisturbed forest with abundant lichens north of TumTum Lake. There is a high diversity of associated species, as well as extensive habitat for sockeye, Chinook and Coho salmon. The park is a very long, narrow strip that roughly follows the Upper Adams River and protects the riparian area on both sides of the river, from the north end of Adams Lake to a point north of Tum Tum Lake. Three routes, all gravel logging roads, access this area: from Highway #5 south of Barriere, via Agate Bay Road and along the west side and northern end of Adams Lake (80 km); from Trans Canada Highway #1 at Squilax to Adams Lake roads (95 km); from Highway #5 at Vavenby, via logging roads (30 km). Use caution when traveling on logging roads – this is an active logging area. The nearest communities are Kamloops, Clearwater, Barriere, Vavenby and Little Fort. The closest public telephone is at Vavenby Store, approximately 30 km away. History: Established April 30, 1996. Conservation: The park encompasses 65 km of undisturbed Adams River floodplain from the Tumtum wetlands to Adams Lake. The park protects a rich riparian area of valley bottom interior cedar-hemlock forests. An undisturbed forest north of Tumtum Lake contains abundant lichens. Wildlife: The park protects a variety of habitats for otters, elk, moose and black bear. Approved Upper Adams River Provincial Park Management Direction Statement [PDF] is available online in pdf format. This river contains rainbow trout, bull trout, and white fish. Anyone fishing or angling in British Columbia must have an appropriate licence. Anyone hunting in British Columbia must have an appropriate licence. Check the B.C. Hunting Regulations for seasons and closures. There are wildlife viewing opportunities in this park. There is no boat launch, but there is opportunity to launch small car top boats. This park only has user maintained pit toilets – no flush toilets. This park, on Tum Tum Lake, offers vehicle accessible, very rustic campsites on a first-come, first-served basis. 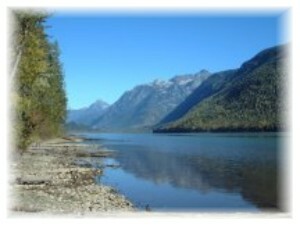 There are two designated campsites, one on the southeast end of the lake, the other on the southwest end of the lake.